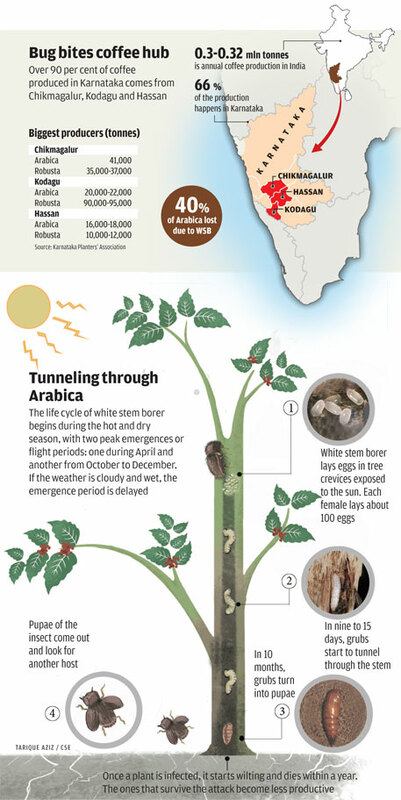 ARABICA COFFEE plants in the Western Ghats are facing a severe threat from a pest called white stem borer (WSB). The threat is particularly alarming in Chikmagalur, Kodagu and Hassan districts of Karnataka (see ‘Bug bites coffee hub’). Member of the Coffee Board of India and former chairperson of the Karnataka Growers’ Federation N K Pradeep says around 40 per cent of fruit-yielding plants have been lost in the coffee-producing southern states due to WSB this year. Arabica is the principal host of WSB, or Xylotrechusquadripes, but the beetle threatens other plants as well. The menace is not new in Arabica-growing regions such as Africa and India where WSB has been present for more than 100 years. But change in weather pattern has started to fuel its growth. According to A S ShankareGowda, coffee planter and former chairperson of Karnataka Planters’ Association, global warming and erratic monsoon make the temperature fluctuate. As a result, WSB which thrives in hot weather, becomes active (see ‘Tunneling through Arabica’). UttamGowda, coffee planter based in Chikmagalur, says the monsoon has been erratic for about a decade. This year too, coffee-growing areas received rainfall in February, followed by a dry spell of two weeks during which the temperatures rose. This led to the infestation. Earlier, rainfall would start only in March end, he says. Earlier, the planters were using pesticides such as gymaxin or byphenolhexa chloride to control WSB. But these have been banned worldwide. Planters say now there are no effective pesticides to treat WSB. They deal with the pest by spraying lime, with commercial adhesives as the binding agent, on plant stems. Another pesticide used is Chlorpyrifos. But these measures have not proved very effective, say planters. The coffee board has recommended that coffee growers should use pheromone traps to catch the beetles. But planters say this bio-control mechanism is also ineffective. The coffee board has also suggested a preventive measure. It says the infested estates should maintain a two-tier system of shade—an upper level of mixed species of permanent shade trees and a lower level of temporary shade trees. These should be maintained in such a way that the coffee plant is not exposed to the sun as the pest becomes active under sunlight. Once a plant is infested, destroying it is the only way to ensure the pest is removed. 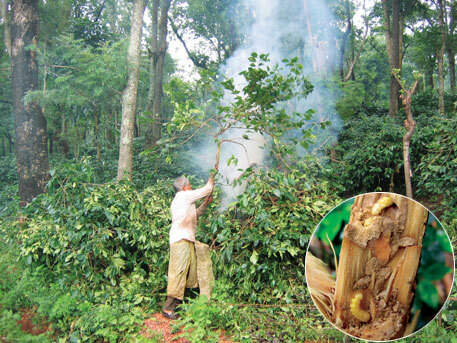 According to scientists at Chikmagalur-based Central Coffee Research Institute (CCRI), the country’s premium institute for coffee research, WSB-infested plants should be uprooted before the pests come out in order to prevent them from laying eggs. Even the uprooted plant should be burned or transported to urban areas for use as fuelwood. Having run out of options, coffee planters have started uprooting infested plants, says ShankareGowda. This will have a disastrous effect on the production next year. According to him, there is no permanent remedy for this menace. In Sri Lanka when Arabica coffee plantations were infested by WSB, theyhad to be converted into tea gardens, he says and adds that planters in Tamil Nadu have started planting Robusta coffee instead of Arabica. Pest infestation would adversely affect the status of the highly valued Indian Arabica coffee. Being cultivated under shade, Arabica helps sustain the ecosystem and is known as an eco-friendly variety. According to PradeepKenjige , chief of Café Coffee Day’s research and development wing, WSB can be controlled by the stem-wrapping method. Several field trials on stem wrapping have also been conducted by CCRI, he says. Kenjige says the method involves complete wrapping of the main stem and the thick primaries with different materials, such as polythene, to prevent the pest from laying eggs. He quotes a field trial done by CCRI on 480 plants at Chettalli in Kodagu district. The test found that wrapping saved plants from infestation for more than three years and did not have any adverse effect on their productivity. The study recommended that fertiliser bags should be used as the wrapping material because they prevent accumulation of moisture. Kenjige says the expenditure required for this work is around Rs 13,480 per 0.4 hectare. However, N K Pradeep is of the view that the wrapping method is labour-intensive and impractical. He says lack of research is the reason the problem reached such proportions. According to him, the coffee board needs to encourage research on WSB. N Keshavamurthy, coffee grower in Chikmagalur, says coffee rates are high in the international market but farmers in India are losing their plants. He sayCCRI is not showing interest in controlling the pest. Planters also want the coffee board to increase the subsidy for replanting in pest-infested areas. They say the sanctioned amount should be increased to at least Rs 1.75 lakh per hectare. Chlorpyriphos is a highly toxic pesticide and should not be used in the coffee ecosystem.Birds are known to be effective predators in coffee, so bird nest boxes may help.A bioinsecticide Metrhizium anisopliae may also be useful. PCIL is marketing it as Grub X. NBAII, Bangalore may take up research on this problem.